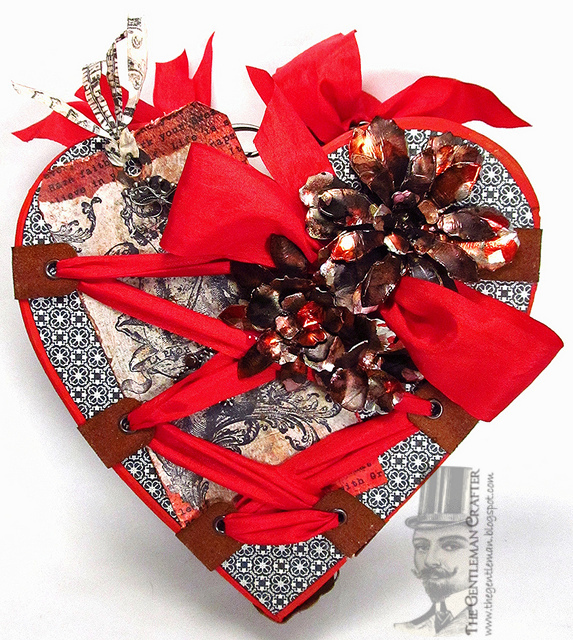 The Gentleman Crafter: Valentine Tutorial Finally Up! I almost made it on the same day as promised...The Third Time I Promised It! LOL!...The 14 Things I Love About You Tutorial is up on my Etsy Store if you have any interest. 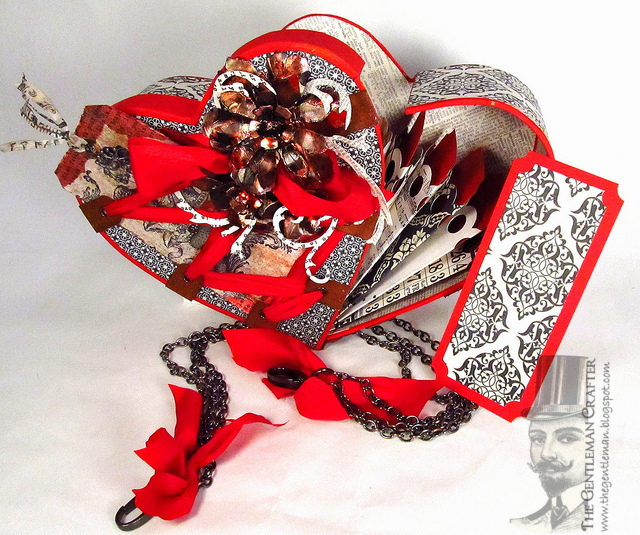 You will need a heart box to make this project. You can fine one from Scrapadabadoo.com..Here. The 14 Things I Love About You Heart Box was originally the heart box I did last year for Graphic 45 and called the 10 Things I Love About You Heart Box. I've been trying to go back to my favorite projects and the most requested projects and do tutorials on them. Does that make sense or is it just time to go to bed? Hahaha! 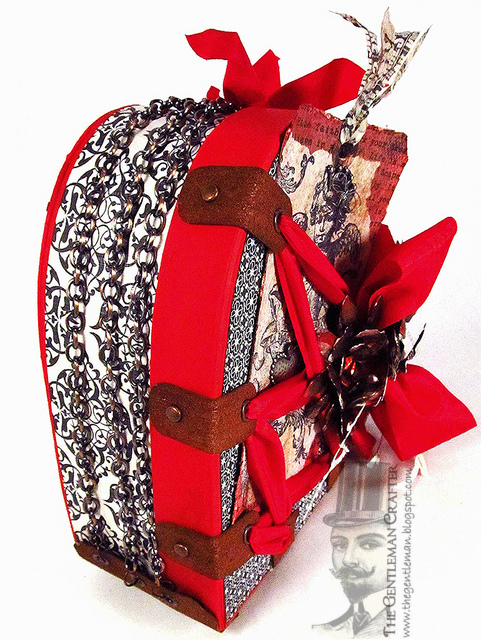 This year I added four more accordion pockets and instead of doing 10 tags to fill the pockets, I made 14 tickets. "Love Tickets"... Basically, 14 tickets that the receiver can cash in for things like, Dinner and a Movie...A Foot Massage....A promise to put the toilet bowl lid down for a whole month....You know those kinds of romantic things! 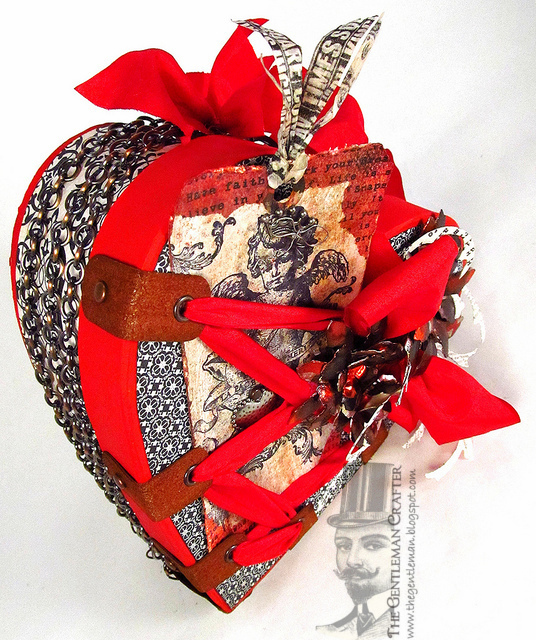 Anyway, here are a few pictures of The 14 Things I love about You Heart Box.. The heart is done. I never got around to making the other 3-D heart piece that I was so hoping to get to this weekend, but will start that day after tomorrow. I think I will do a YouTube video tutorial on it. 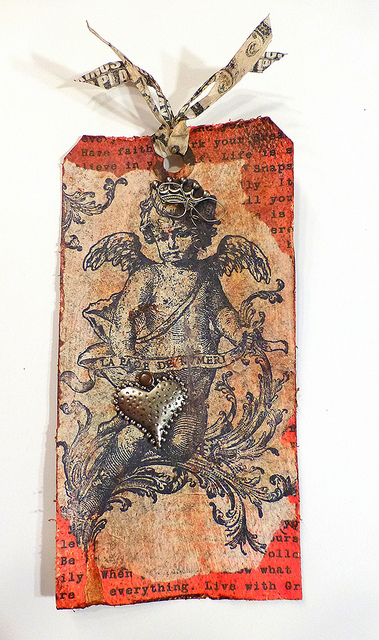 First though, I need to finish making some more Valentine cards. I've got a few ideas that keep rolling around in my head that I need to make happen before I go nuts! Well, until tomorrow then my friends! I'm hitting the hay! Have an awesome night or....morning! Exquisite! 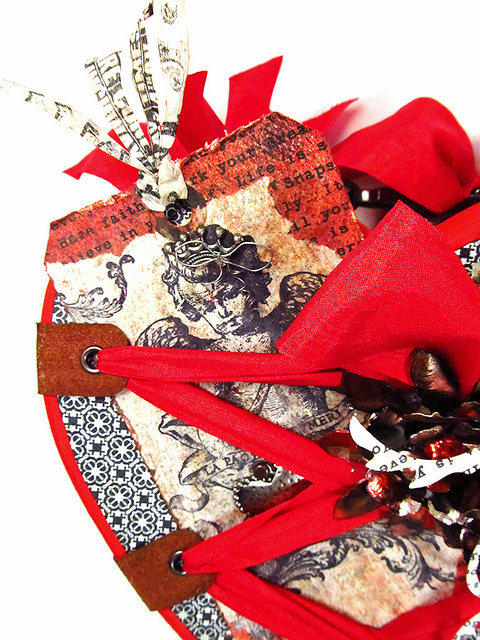 The tag is just gorgeous all on its own....and combined with those amazing metal flowers and corseted heart...ooh-la-la! BTW...I finally launched my blog...I would just be thrilled if you found a minute sometime to check it out....www.kathybydesign.com Thanks, Jim! This is stunning Jim! You already know how much I loved this project and the heart box that you kindly sent as a wedding gift has pride of place here as one of my most treasured possessions. You are so clever to keep coming up with such beautiful constructions - long may it last! Very strategic placement of the heart on the cupid. LOL. Got to keep it kid friendly! I may have to break out the chipboard this weekend! Oh Jim, how awesome.. that is so pretty, sweet, gorgeous..like the idea.. i will have to go back and see last years, i think i have seen it before but again you know my old age...lol..have a great week! This is wonderful. I don't remember this, must have missed it the first time around. Loving the black and red. This would also make a great wedding decoration/present. And hey, that watermark is very cool! Thanks. Looks beautiful, Jimbo!!!! Love the new logo...so professional!!! Fabulous!! Especially like the tag on the front! I was so hoping to find out about the flowers... did you make those? Love it and Love that you changed it to 14 tags for Feb 14th. I also love the tag tucked on the cover under those laces... Great Job!!!! Thanks! I was waitting for this tutorial and just ordered it! As I told you, my son is getting married and I really want to make ones for him! Your heart box is gorgeous! You continue to amaze me! Love your new watermark! Have a wonderful week! Loved it then... and love it now!!!! Gorgeous! I had to study all the details! Beautiful, and well worth the wait! Forgot to mention your new watermark, I LOVE IT!!! Wow!!! Now that is spectacular! There is just nothing I don't love!